Ada dosa is a popular traditional morning breakfast or evening tiffin in Kerala Iyer households. It is a thick dosa made of coarsely ground parboiled rice and lentils. It is a balanced food consisting both carbs and protein and after having a couple of adais, your stomach feels very full for at least 3 hours. 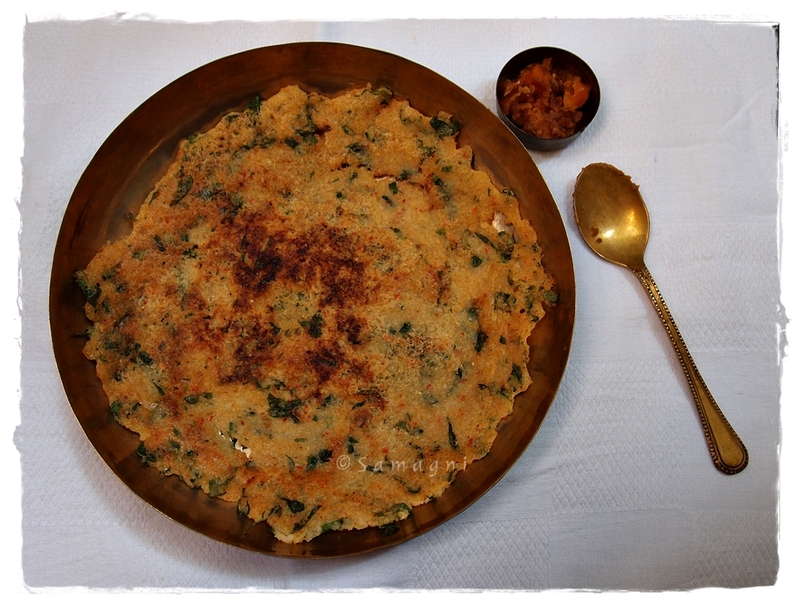 Adai is a family favorite and we make two variations. One is with rice and multiple dals and the other one with rice and chana dal and drumstick leaves/methi leaves mixed in the batter. This is a very good way of including greens in your diet. Earlier I had shared a soft and instant dosa with drumstick leaves made of raw rice. Check it out here. Wash and soak the rice, chana dal, and dry red chillies together for 3-4 hours. Grind the soaked ingredients along with handful of shallots (or 1/2 tsp asafetida) coarsely. Since only coarse grinding is necessary, you may use a mixer to grind in batches. Add necessary amounts of water to grind the batter to a medium consistency. Do not make it too loose. Add salt and drumstick leaves/chopped methi leaves to the batter. Mix well. Batter consistency should be thicker than the dosa batter. Ada dosai batter does not require fermentation. Heat an iron griddle. Use a cotton cloth to grease the griddle with sesame oil. When the griddle is hot, spread a ladleful of batter and spread around to make a thick dosa. My grandmother never used to a ladle to spread adai. She would use her hand to spread the batter around. Drizzle oil around the adai batter and in the middle. Do not economize on oil. Since this is a thick dosa, a good amount of oil is needed so that the batter gets cooked properly. Cook in medium heat. When the sides start getting brown, turn over and cook the other side. Cook until both sides turn crisp. Remove from tava and serve hot. Since this is a spicy dosa, it does not need chutney. It is traditionally served with unsalted white butter or jaggery.